Life can be extremely busy so that we sometimes leave booking a holiday until the very last minute. This page will help identify cottages and log cabin holidays with a swimming pool that are available in the next week or so. A holiday with a swimming pool, either shared or private is the most popular self-catering holiday choice. The notion of going for a swimming or to sit in a warn bubbling Jacuzzi is very pleasant. Holidaymakers like to have the option even if it is used only a couple of times. Good deals can often be obtained by booking that last minute break that may have arisen because of a cancellation. It is lovely to have the pool to use on holiday and even better if it comes at a discounted price. Sign up to a last minute newsletter on indeed any cottage holiday newsletter. Holiday companies are always very keen to try to promote and obtain bookings for their cancellations and it is better to take a little less for the booking than not have one at all. The other way is to check Late Availability listings which is also useful except that the onus is on the holiday maker and it is easy to forget. The largest discounts will be on holidays that have only a few days notice. This suits people who can just pack a bag and leave in a day or two. Couples find this option quite useful because they may not have to make any special arrangements if they plan to go on holiday in a hurry. People who have pets to make arrangements for may find this a little trickier. The same applies if going on holiday with friends. 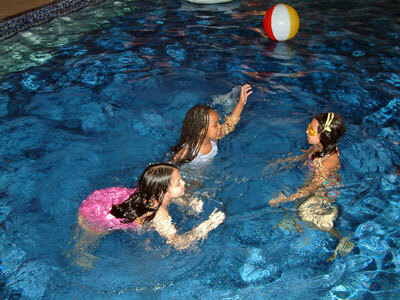 Children usually make a self-catering holiday with a pool worthwhile. It is amazing how many hours children can entertain themselves for in a swimming pool, especially if there are two or three or more. With a private pool, children have the freedom to jump in and out as often as their energy lasts and the rules that apply to public swimming are not applicable. It is that bit more difficult to take the risk of waiting for a last minute cottage booking when children are involved and cottages with swimming pools are always the first ones to become fully booked. Obtaining that late cottage deal might work if you are happy to make a choice from the list available and have the philosophy that you will be satisfied with what you get. Just keep in mind the phrase that 'all comes to he who waits'.